A dialogue panel will be displayed. 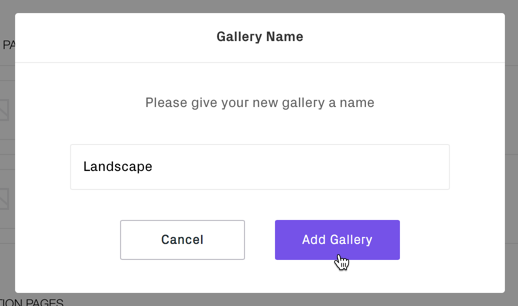 Enter a name for your gallery. Tap 'Add Gallery' or 'Cancel' to exit. You can change your gallery pages name via the Pages > Settings > 'Gallery Title' field. 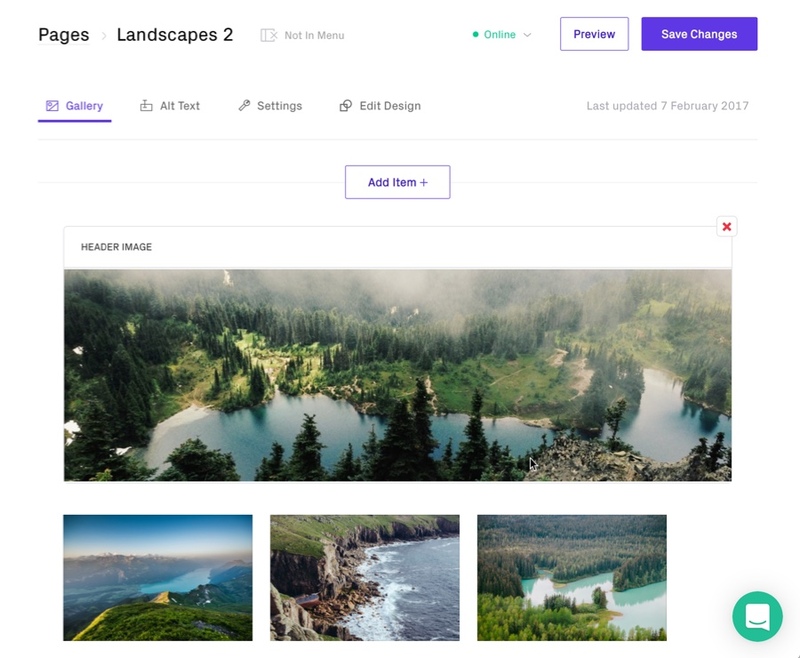 Your new Gallery Page will not automatically appear in your Site Menu. See our Page Visibility article for more information. Tap 'Add Item +' and select from dropdown menu. Adobe® Lightroom®; direct upload using our Format Publisher plugin. Learn more. Tap 'Add Item +' > select 'Image'. Choose option for adding image/s. Find more information on how to prepare your images for Format. 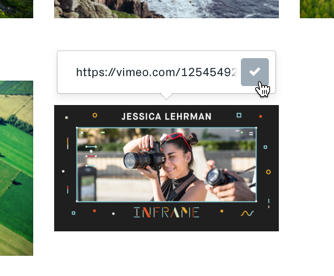 Videos can be added from YouTube or Vimeo URLs. Locate and copy the full YouTube or Vimeo URL from the browser address bar. Paste in the full URL from YouTube or Vimeo and tap the checkmark. 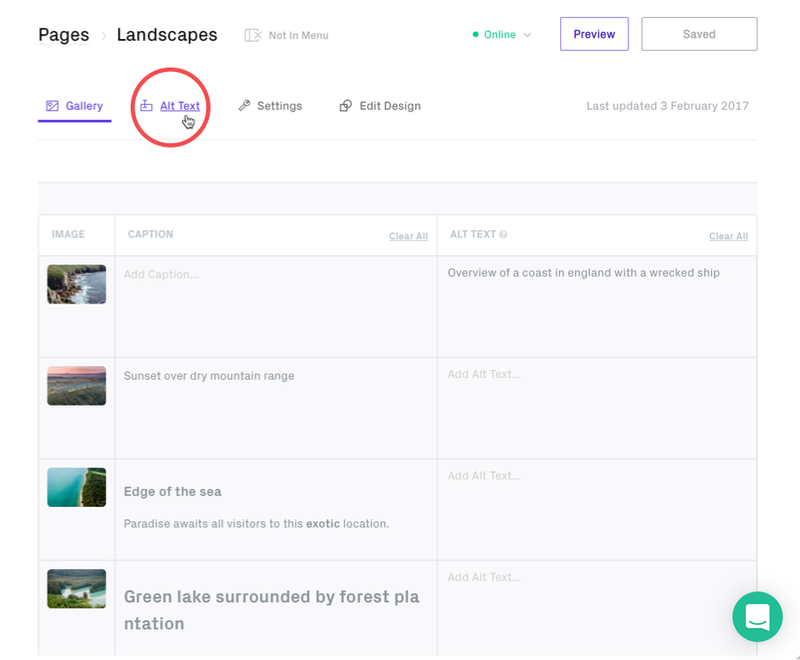 Text Elements will add text to your gallery page and are useful for longer sections of editorial content. Tap 'Add Item +' > select 'Text Element'. Tap within the text area to start writing. Selecting text will bring up formatting options. Text will save automatically (you still need to 'Save Changes' before viewing/leaving page). The HTML button (available on Pro, Pro Plus and Unlimited plans) allows you to add custom HTML to your gallery. Note that you may lose content if you switch between TEXT and HTML. Back up your work in an external text editor before switching. 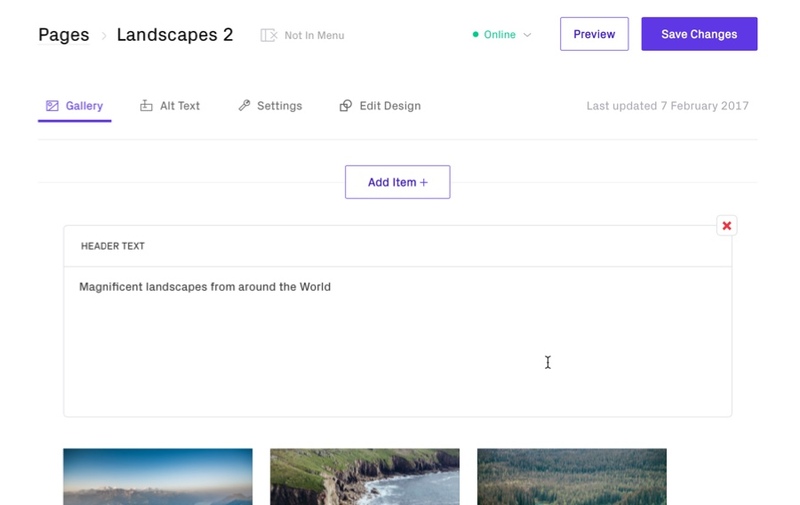 Header Text will appear at the top of your Collection Page and is useful for introducing your gallery. A narrow, landscapes style crop may work best, depending on your chosen theme, you may need to 'Preview' and adjust in an image editing application before adding. You can add a Header Image or Header Text but you can not use both at the same time. You can edit Captions and Alt Text for gallery page images. To edit Alt Text for an image, hover thumbnail and tap the 'Alt Text' button (it looks like a little tag). To edit a caption, tap below the thumbnail to activate the text field. Alt text should describe the content of an image. 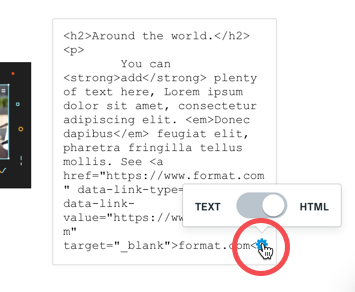 Alt text will not be 'visible' on your site. 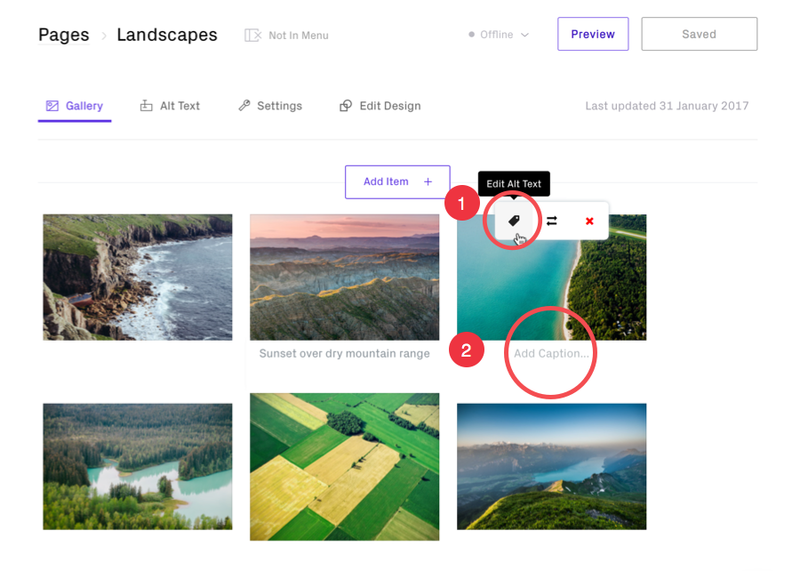 Alt text is designed to help search engines index your images. 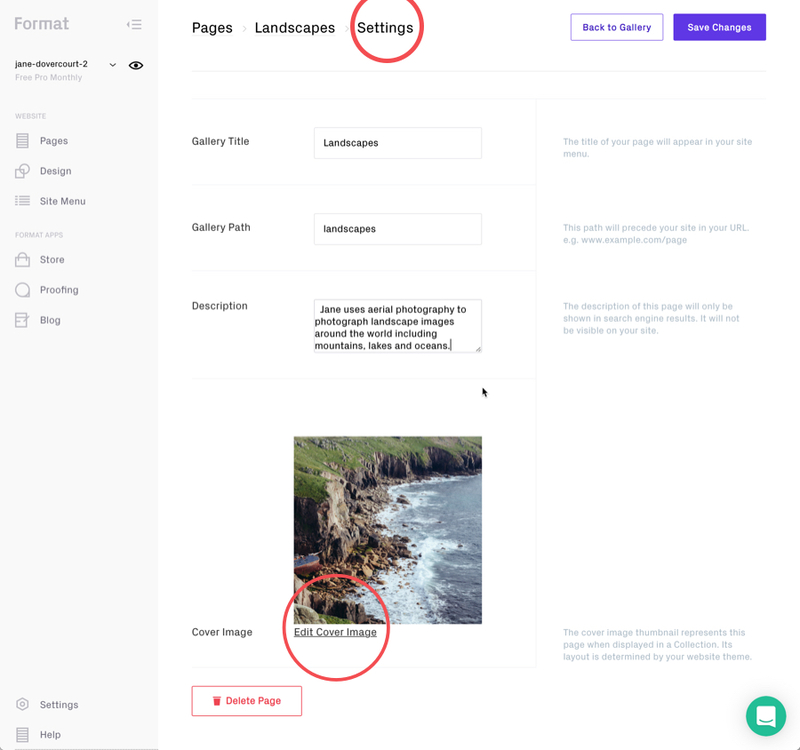 It is also used to help visually-impaired people understand the content of your site by describing what is depicted in an image. See our Search Engine Optimization article for more info. The Alt Text Editor can also be used to edit Captions and Alt Text. You'll also find an option to remove all information by clicking 'Clear All'. Move any item (except for Header Text or Header Image) by tapping-and-dragging' on any thumbnail. Hover thumbnail images and tap in lower left corner to select more than one image at once. 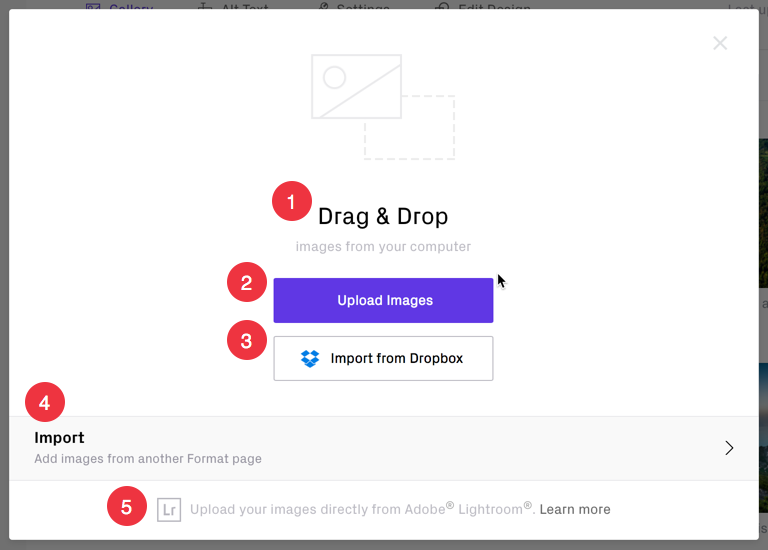 You can now change the order of multiple images or Delete them at once. Any changes you make within the Page Editor will not be applied until you tap 'Save Changes' in the top-right corner. If the 'Save Changes' button is a white color and shows 'Saved' it means that all changes have been saved and up-to-date. 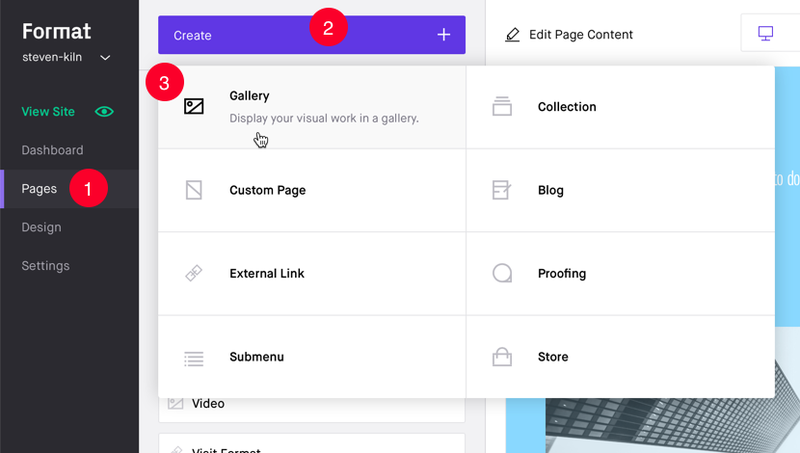 Gallery Title: the title of your page how it will appear in your site menu. Cover Image: the cover image thumbnail represents this page when displayed in a Collection. Its layout is determined by your website theme. Read more. Tap 'Preview' to see you page as it will appear on your live site. 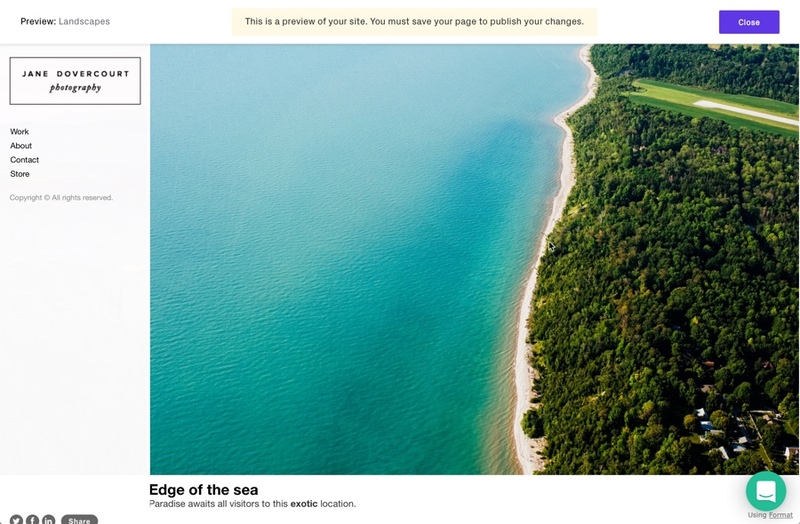 Your site may appear different from the example above (Horizon Left theme). You can make changes within the Design panel. Your Gallery Page needs to be added to the Site Menu. Hover the 'Not in Menu' link and tap the 'Change' link that appears.